Buy at Karma Condos! For Sale Unit #2107 at 15 Grenville St.
Update: This condo sold for a Toronto record price for sub 500sqft condos. It also set a new record for price per square foot in the building. 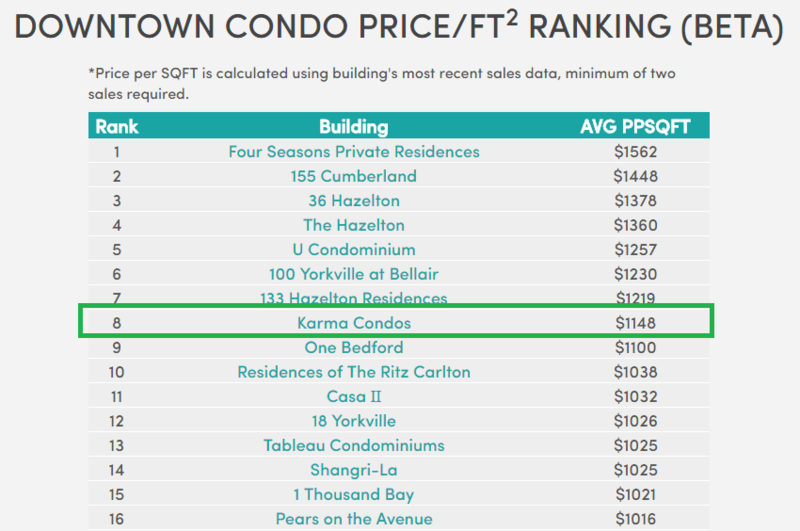 If you want Karma on your side, Karma Condos is where you will find it. The luxurious Karma Condos sit just off of Yonge Street at 15 Grenville St. Just steps from Yonge and College Subway Station. This is hotel style living in a prime downtown location. Karma Condos were built by Lifetime Developments and Centercourt Developments. The building was completed in 2016 at 50 storeys tall with a total of 495 units. Unlike many buildings downtown, Karma Condo units all feature 9′ ceilings making the square footage go just that much further. Well thought out layouts are found consistently throughout the building. Fitness Centre: The entire 2nd floor is dedicated to this incredible fitness centre that would rival most high-end gyms. It includes a weight area, cardio equipment and a yoga section. The Social: A party room with a bar, projection screen, modern fireplace, balcony seating area and private dining room with a servery. Players Club: A pub-like bar with felted poker table, billiards and table-tennis. Not intended to solicit buyers or sellers currently under a contract with a real estate brokerage.